Photo: Girls at our computer camp are happy to learn the basics of desktop publishing. A massive monsoon storm hit our main campus in India this past weekend. Sadly, our rooftop gardens were completely destroyed, several banana trees in our grove are gone, and we sustained damage to our solar arrays and electrical connections. Despite these setbacks, we were still able to hold the second annual computer camp this summer from May 11th to June 10th. 13 children from our orphan homes and 12 children from the local villages were enrolled in the camp — their ages ranged from 8-15 years old. We offered the children courses in Introductory Windows, Desktop Publishing, Photoshop, Microsoft Office, Microsoft Word, and Microsoft Excel as well as instruction about the keyboard, mouse, and typing. Desktop Publishing has been challenging for the children, but they will learn more about this skill during the school year. All of the children enjoyed the computer camp, and they were excited to graduate on Wednesday. 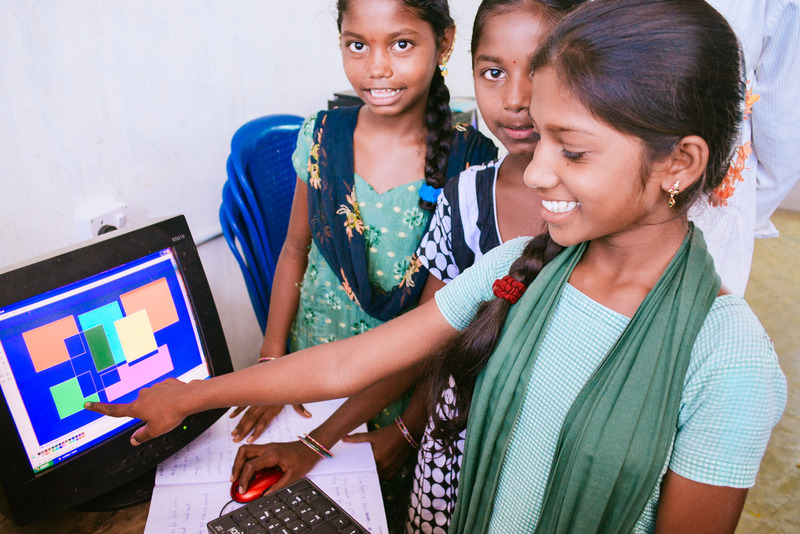 18 of the children enrolled in the camp had never used a computer before, and now they are looking forward to practicing these new valuable life skills during their free time. As donations are provided, we look forward to restoring our rooftop gardens where we grow eggplant and beans; local varieties of squash, okra, cucumber, tomatoes, and chilies; a variety of curry leaves; and cauliflower, carrots, onions, garlic, spinach, and tamarind. We also look forward to planting more banana trees, and repairing the damages to our solar power systems. Our garden and farmland enterprises are very important as they put fresh, organic ingredients in the children’s meals, supplying them with many important vitamins, minerals, and other nutrients. Solar power at our main campus is also very important as it provides a reliable source of electricity, a 40% reduction in our electricity bill, and hot water which the children especially enjoy during the winter season. The system also provides lighting during the frequent and prolonged power outages in the region, which is important for security in the night and for the children getting ready in the morning or preparing for bed after sunset. Previously we were presented with several challenges that we now no longer face, such as children taking lanterns to use the restroom, security concerns, and more. In coming months, we will report back with good news about our farmland and garden harvests, solar power restoration, and the children’s continued computer education.